Queen’s Oak is a women’s morris side from Potterspury in Northamptonshire, a village adjacent to Watling Street just north of Milton Keynes. The side performs a mixture of traditional dances from Herefordshire, Worcestershire and Shropshire- the Welsh border counties- along with modern dances written in the same spirit. The current side has fifteen-plus members from the ages of 15 to 60+. The name originates from the ancient tree growing in the fields to the north of Potterspury associated in local legend with Elizabeth Woodville, Queen of the Yorkist King Edward IV. Find out more here. Queen’s Oak was formed twenty seven years ago by Sue Atkinson. 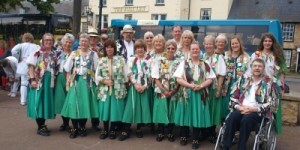 Before moving to Potterspury Sue had danced with Lord Paget’s Morris, and upon discovering that there were no sides in the Milton Keynes / Northampton area who danced a similar border style, she decided to start one. Over that first year the side picked up members and momentum , and at the first AGM in January 1986 two important decisions were made. Firstly, the constitution was discussed. Secondly it was decided that Queens Oak would not black up. The dancers were adamant about this and the musicians were told that they could black up if they wanted to. They declined.